Henri Matisse was the master of line. In all its variety—patterns, incisive contours, decorative curves—all he put in service to rendering the essence of form and content. Matisse descends from a long line of the greatest artists France has ever produced and to whom the purity of line and the clarity of narrative were absolute: Nicolas Poussin, Jacques-Louis David and Jean-Auguste-Dominique Ingres. 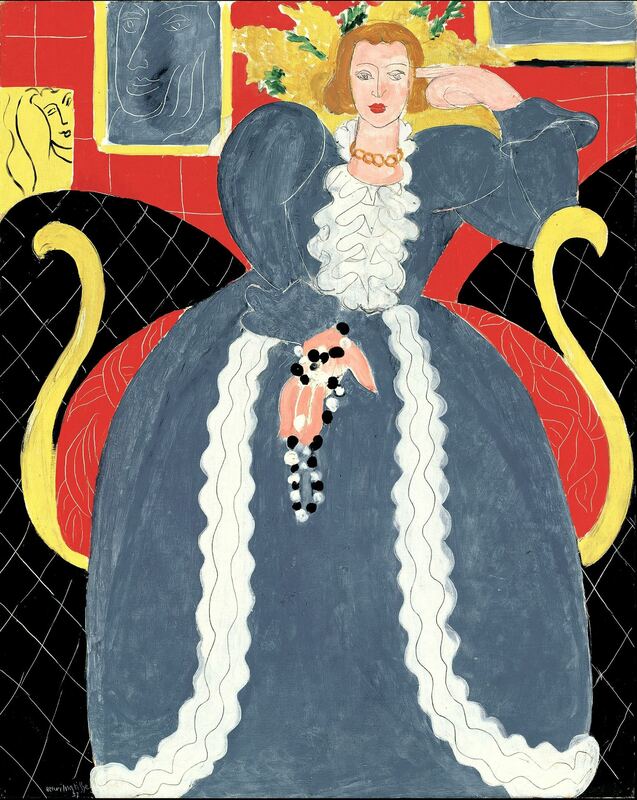 While there have been many exhibitions on the artist, Matisse: In Search of True Painting at the Metropolitan Museum of Art until the 17th March sets out to examine for the first time in depth Matisse’s practice of painting pairs and trios of the same composition. The exhibition is sensuously beautiful and intelligently conceived. It expands upon Matisse’s impulse—especially true in French art of the 19th and early 20th centuries—towards repetition and serial painting. While one may immediately think of an Auguste Rodin or a Claude Monet in this respect, ultimately Matisse owed this to his love and intense study of the old masters. Although acutely aware of the great artists of the past and his place in the history of French art, Matisse has come to be known as one of the greatest Modern artists. Trained at the Académie Julian with that staunchest of academic painters, William Adolphe Bouguereau, and later with fin-de-siècle fantasist Gustave Moreau, Matisse would have been familiar with the major debates within the French art establishment. Since the late 17th-century, the Academy had argued the relative merits of Poussin—who represented the supremacy of design or line—over Rubens’ color and affect. This was in itself a rehash of the Italian Renaissance discourse on disegno over colore, and this discussion continued well into Matisse’s century with the classicism of David’s school set against the chromatic effects of Delacroix and the Romantics. Echoes of this age-old debate are encountered early in the present exhibition in two paintings: Le Luxe I (Esquisse) of 1907 (Centre Pompidou) and Le Luxe II (1907-08; Statens Museum for Kunst, Copenhagen). As with many other of the pairs and trios of paintings exhibited here, the first is lightly painted with loose brushwork. 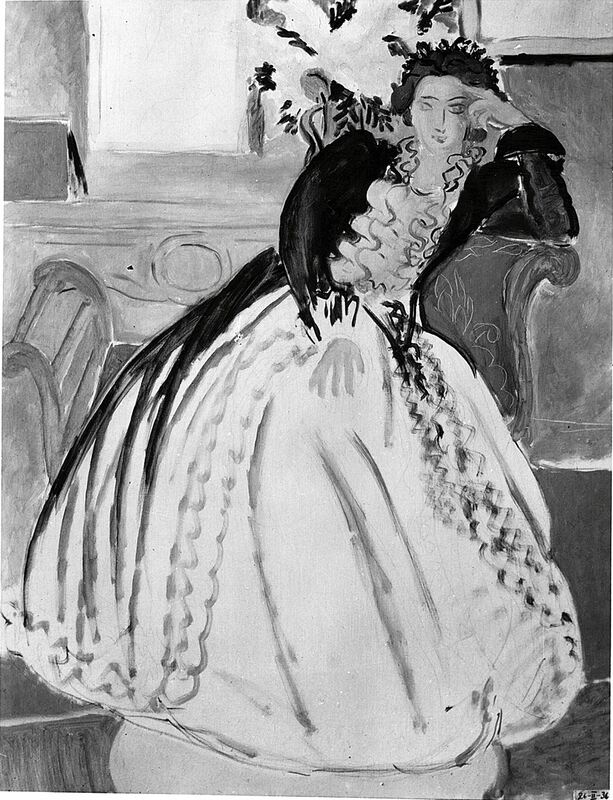 In numerous instances Matisse used the term esquisse or “sketch” not only to denote style of execution, but position as the initial or original working-out of the concept. The second—while generally conforming to the original composition—is far more linear and geometric with flat fields of color and heavy contours. 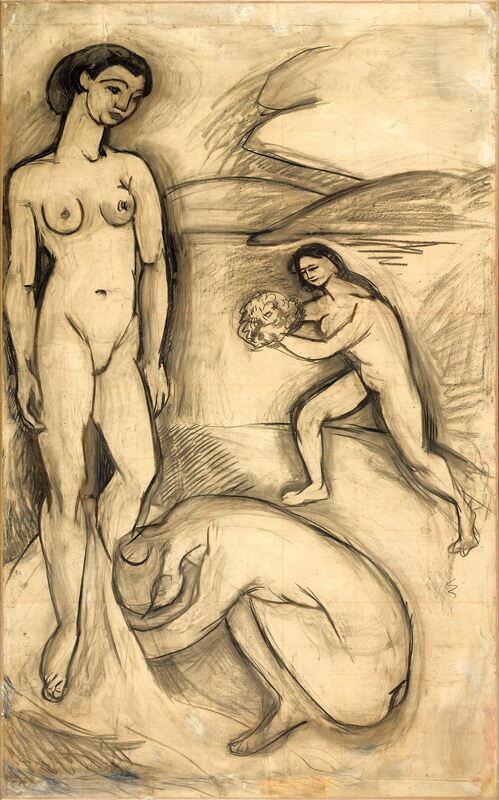 Unique to this particular pair is a full-scale drawing (1907; Centre Pompidou) that underscores Matisse’s sense of independence for his first versions, as this drawing was created to serve as an aide-mémoire while La Luxe I was being exhibited, so that he could faithfully recreate the second of the pair, Le Luxe II. Despite the drawing’s placement between versions, it nonetheless remains rooted in the academic tradition, as a preparatory step, emphasized by the customary chalk “squaring” made in order to transfer the design to the second canvas, in turn borne out by marks of the squaring underneath the paint of Le Luxe II. In short, these two paintings and their drawing constitute a dialogue between Matisse and the academic tradition from which he developed as well as codifying the artist’s use and meaning of the term esquisse. Does Matisse’s artistic process reflect these ancient aesthetic debates and can the contrasting painting types that he developed in his “search for true painting” resolve old conflicts? Although the painterliness of Le Luxe I might seem to signify the tradition of Rubens while the second, later picture that of Poussin, I suggest that it is in fact the opposite. The first version may be seen to represent the composition’s framework, conceptual and otherwise, and is thus aligned with Poussin’s emphasis on clarity of composition. Le Luxe II emphasizes color, rhythm, and affect as did Rubens. 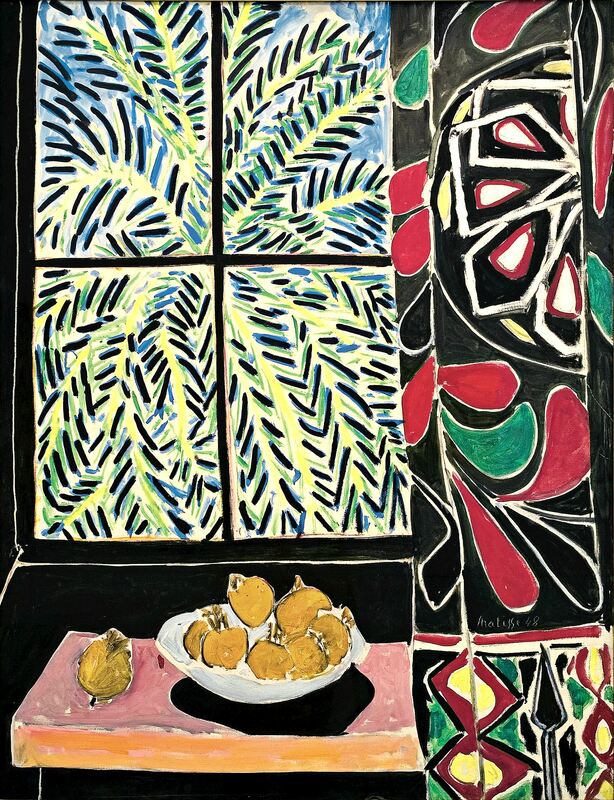 Matisse lays out for us, in this pair and others, a modern and sophisticated play of opposites, all the while being grounded in the classic French academic tradition. 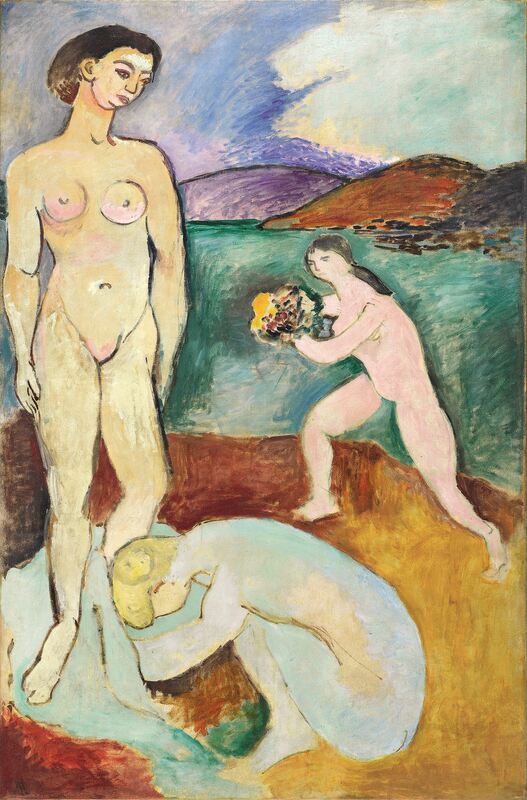 The exhibition opens with Luxe, calme et volupté (1904; Musée d’Orsay), a fine example of Matisse’s early experimentation with various artistic styles. 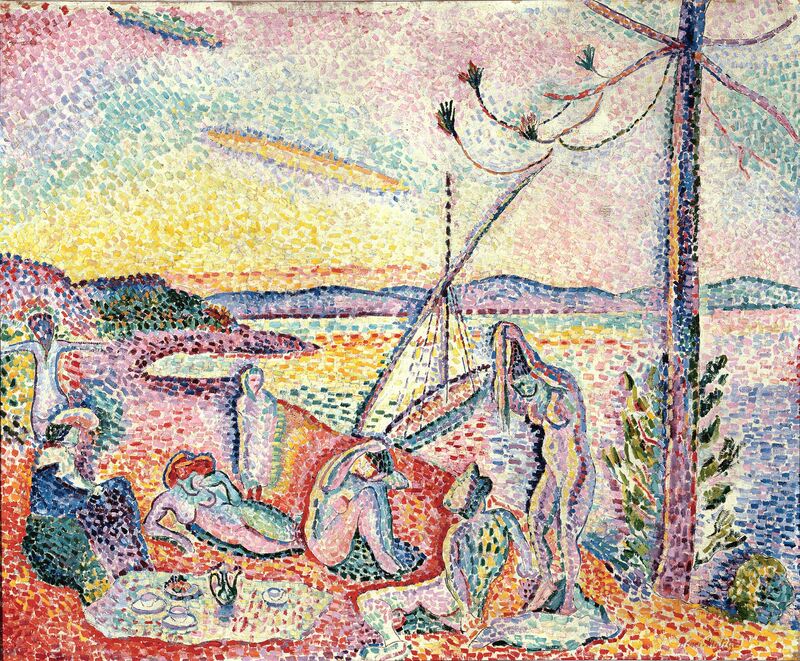 This included Neo-Impressionism; Fauvism; and here, Pointillism, such as is exemplified in the work of Paul Signac, Matisse’s mentor and first owner of this painting. Its title refers to the refrain in Charles Baudelaire’s poem “L’invitation au voyage” in Fleurs du mal (1857). Rarely has a title so completely summed up both a subject—here an idyllic repast at the beach—and the aesthetic of its creator. The sense of ease and earthly pleasure is replete here, running throughout Matisse’s world of brilliant light, color, form, flowers, dancers, interiors, patterns and all such sensual delights. In early 1912, Matisse wintered in Tangier, painting a series of related landscapes (he found that genre difficult, and his later work concentrates mainly on the figure and interiors). But in Palm Leaf, Tangier (1912; National Gallery of Art) the challenge he found in painting nature is completely belied by the elegant simplicity of design and gorgeous manipulation of paint on the thinly painted surface. Most memorable is the artist scratching into wet paint the contours of the leaf with the wooden end of his paintbrush, thereby completing the fanning palm already partially rendered with a flat brush. The sure, incised line here emphatically insists on its own supremacy. The Museum of Modern Art, New York, Acquired through the Lillie P.
Bliss Bequest, and the Henry Ittleson, A. Conger Goodyear, Mr. and Mrs.
Next, two series of the same format and date stand out, all four paintings done in 1914 at his long-time studio at 19, quai St. Michel. 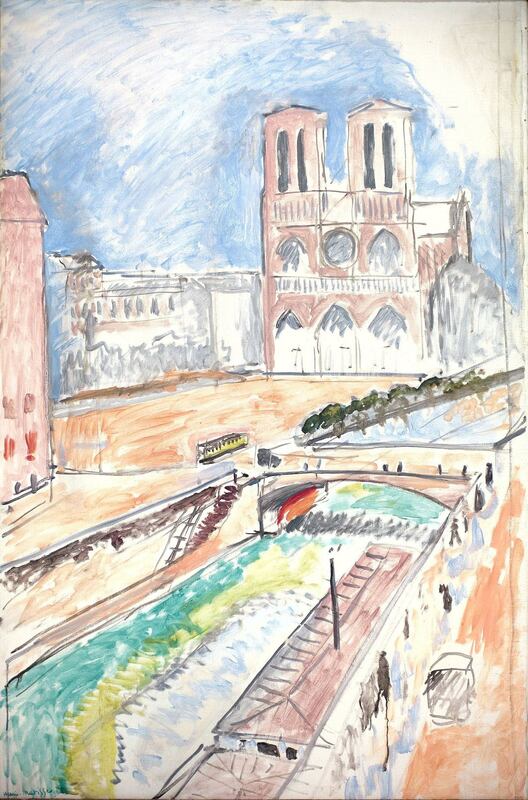 The first series shows the view of Notre Dame from the studio window. While in both pictures it is the same view, true to form the two paintings contrast in facture and even mood. One is thinly painted sunny noontime (Kunstmuseum Solothurn) and other, a menacing nocturne (Museum of Modern Art). Furthermore, the latter is a complete reduction to line, representing Matisse’s clear response to Cubism. The MoMA painting knocks one back with its elegant severity, its reduction to the essential (the cathedral, the tree, the river, the urban grid). This subject and its viewpoint led me to recall Rick Brettell’s great 1992 Dallas Museum of Art exhibition, The Impressionist and the City: Pissarro’s Series Paintings. Here is a nod to Matisse’s beloved Impressionists, their concern with seriality, and in particular, Pissarro’s marvelous window views of the urban landscape. 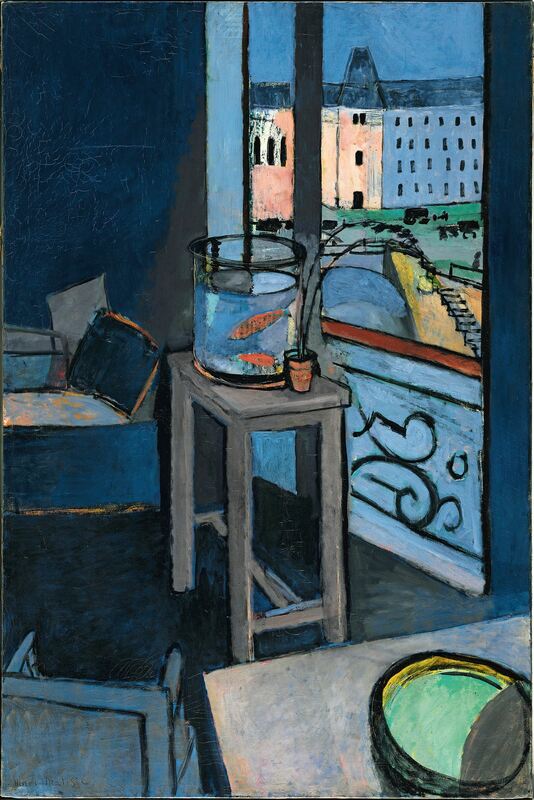 The Museum of Modern Art, New York, Gift and bequest of Florene M.
Likewise, the Interior with Goldfish (Centre Pompidou) and Goldfish and Palette (MoMA) depict this window with a view, but step back to take in the room’s interior, the focal point being a glass cylinder filled with goldfish. The point here is not so much the other comparisons we have seen between thinly painted “sketch” and the second, heavily worked up twin. 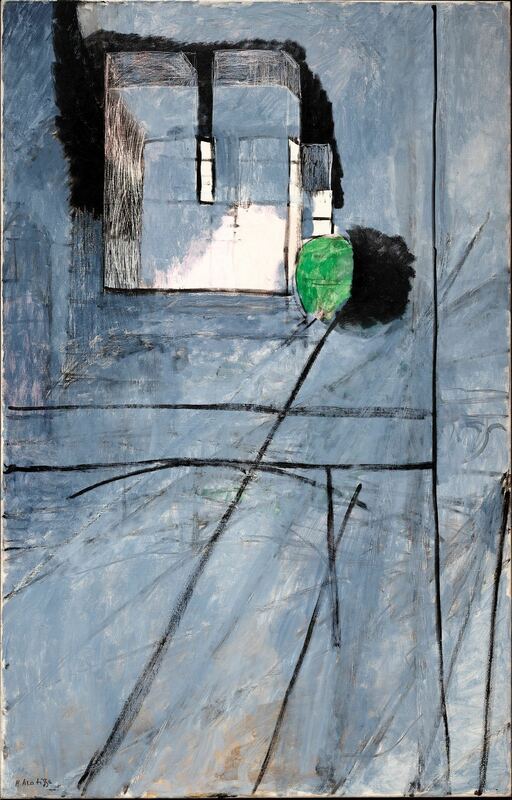 Here we have the same subject and similar level of finish, but with a contrast of perspective (in the first painting it is skewed) and, more to the point, a level of abstraction rarely encountered heretofore in Matisse. (Interestingly, the artist had already switched viewpoints from one to the other version two years earlier with Nasturtiums with Painting “Dance” I at the Met and the second picture now in the Pushkin Museum, Moscow—not shown at the Met due to the Russian loan embargo.) Here also the artist addresses Cubism as well as his pursuit of the reduction to the essential by rendering in a highly schematized manner and flattened, vertiginous perspective the room, the window and balustrade, and even himself. The artist’s presence is most noticeably indicated by his palette held by his own thumb, but upon closer inspection, his figure, Matisse’s legs and bent profile, can be seen to the right rendered in the most Cubist terms. In the catalogue, renowned Matisse scholar Jack Flam brilliantly reconstructs the artist’s development of the composition by referring to a postcard on which Matisse sketches his original design, the artist next to the table and the window, painting the goldfish. What was on the postcard’s front? Dürer’s famed image of St. Jerome seated at a table next to a window in his study. The saint is a proxy for the artist and the study, his studio. Flam neatly ties it all up with the consideration of le regard, the artist looking at the composition and we the viewer looking at the artist. Matisse: In Search of True Painting takes a sharp turn with the last two galleries which examine the artist’s later habit of documenting his artistic process in photography and, in fact, exhibiting the process photographs next to finished paintings such as occurred at the Galerie Maeght in Paris, December 1945. 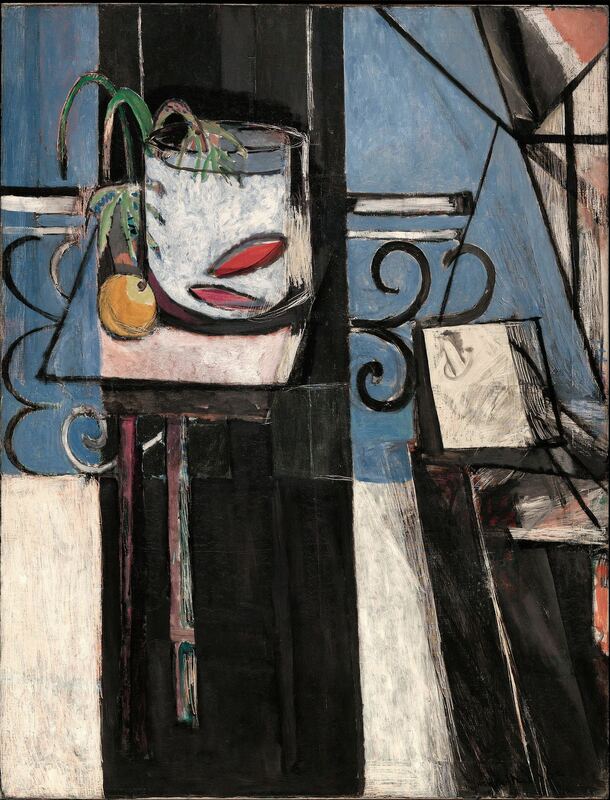 First encountered is Matisse’s stupendous The Large Blue Dress (1937; Philadelphia Museum of Art), showing his model Lydia Delectorskaya posed in said blue dress seated on a settee in the artist’s Nice studio. From the brilliant red walls and shiny black floor to Lydia’s deep blue dress, all is cogently delineated in a variety of painted or incised line, creating an array of pattern that has the simultaneous effect of providing detail and yet imparting a decorative abstraction. Ten accompanying photographs document at least nine stages of development, the artist revising, wiping paint away, and refining the composition over five or six weeks. Even the original blue dress is exhibited here. I found it slightly distracting. The recreated Galerie Maeght installation for The Dream (1940; private collection) was even more problematic. Usually, the art historian in me is delighted by such contextualization but somehow the massing of black and white photographs surrounding the original seemed too much and detracted from the painting’s own impact. Matisse had determined that such a demonstration was necessary as apparently critics thought his work facile, and so in December 1945 at his Paris gallery had photographs hung with finished pictures. As Rabinow in the catalogue says in response to critics grumbling at the publication of the ten photographs of The Large Blue Dress, “Matisse would likely have argued that the finished painting was proof enough.” Indeed. Matisse’s career—along with the present exhibition—culminates with the glamorous and complex works like The Large Blue Dress, Interior with an Egyptian Curtain (1948; Phillips Collection) and Large Red Interior (1948; Centre Pompidou). By the time he ceased painting some six years before his death, Matisse arrived at last at the synthesis of the two types of paintings he had developed early in his career and which form the basis for this exhibition. These late paintings combine the qualities of both the esquisse and the finished works of boldly schematized color. With these magnificently meshed types Matisse gives us works both specific and abstracted. 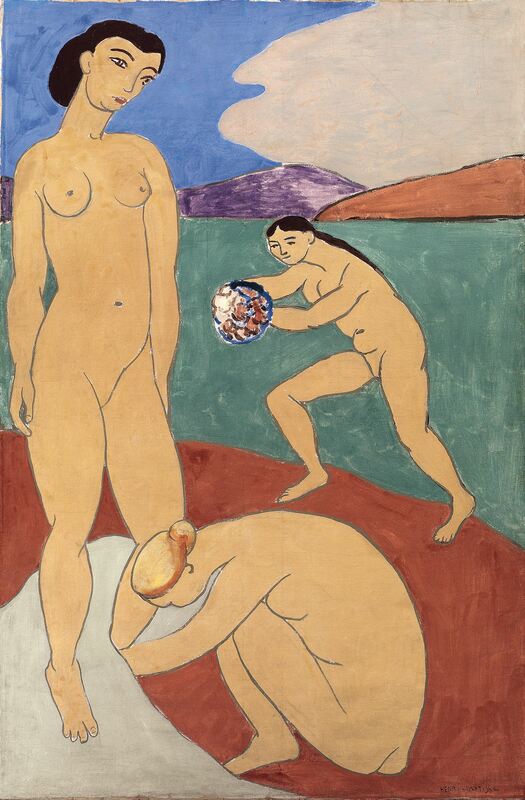 In them, Matisse had finally resolved the centuries-old dispute between the Poussinistes and the Rubénistes: together line and color triumph.